Yesterday was my first day out. 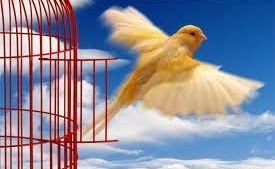 Now I know what a caged bird feels like when they're set free! Mr. Painted Quilt took me for a drive in the beautiful sunshine. I was very apprehensive because trying to maneuver through the snow that is still on the ground is not easy, especially when using a walker. Today is another beautiful day so out we went again to to meet some friends for breakfast. What fun! I have to continually remind myself not to over do it...at least not until after Thursday when I see the orthopaedic surgeon for my post-op examination. I'm hoping that everything has healed as it should and that I'm given the go ahead to climb the stairs. If so, you'll know where to find me! It's sold and is going to live in Texas! 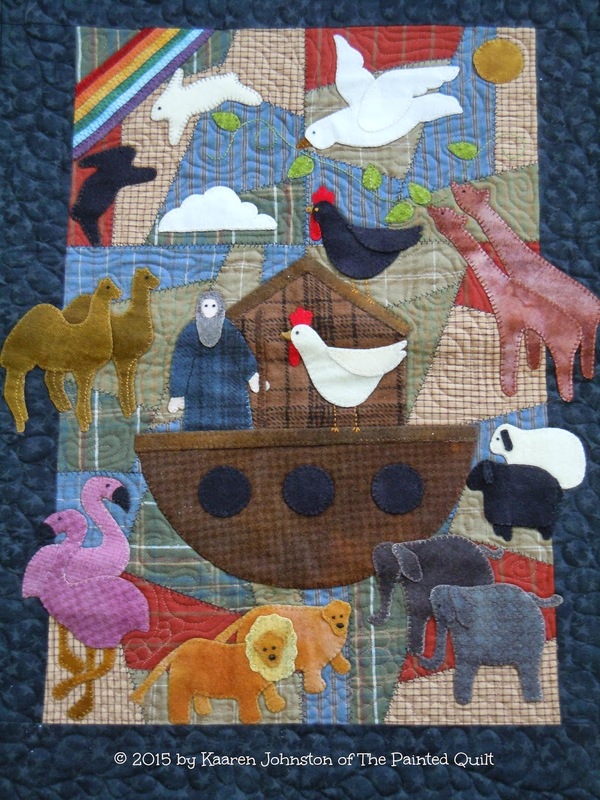 As part of our downsizing process, I've decided to sell my Noah & Friends mini or wallhanging quilt. Our almost 200 year old farmhouse has minimal wall space that is conducive to hang or display pictures or quilts. The quilt is one of my original designs and measures 28" x 20" and was featured in the Spring 2015 issue of Primitive Quilts & Projects magazine. The background is constructed in the "crazy quilt" style from brushed, 100% cotton fabrics and the appliqued elements are made from over dyed, 100% wool and was machine quilted by my friend Lisa Potter. I have hand appliqued each one using the blanket stitch and Valdani threads. I only make one of any of my designs so if you'd like this one-of-a-kind treasure, it is for sale for $300 US which includes shipping. If you'd like to purchase it, please email me and I will send you a Paypal invoice to complete the sale. The link to my email is on the sidebar of my blog. Just click on the envelope that is pictured there. This is certainly been a winter for the record keepers! On Sunday, a third nor'easter made it's way up the eastern seaboard and blew through the Atlantic provinces dropping 1' - 2' of snow. In some places the snow turned to rain which was followed by a flash freeze resulting in serious flooding in some areas because of the storm drains being covered with snow. We were "lucky" enough to get a mere 18" of snow. Because of the storm, I had to cancel my doctor's appointment yesterday because we couldn't get out. It took almost two days before our road was plowed. Thank goodness for neighbors with tractors or we might have been housebound until July! The snowbanks on the side of the road are over 6' high! I continued to work on the blocks for my version of Leanne Beasley's Down in the Garden quilt. Only one more to go after this next one. Then I can start to cut and piece the patchwork blocks...as soon as I'm given the go ahead that I'm able to climb the stairs to my studio. I can't believe that it's been almost two months since I've been up there and boy do I miss it! My "to do" list keeps on growing, probably because I've had so much free time on my hands and as a result, have spent too much time surfing and shopping on the internet! It'll be three weeks tomorrow since I came home from the hospital. I don't have too much to write about because I really haven't been doing anything too exciting, apart from the odd snatched moments where I've felt like picking up needle and thread. Surprisingly though, the days just seem to fly by and thankfully, boredom seems to have eluded me. I'm plugging away on my redrawn Down in the Garden quilt by Leanne Beasley. I think I have an additional four blocks to complete after the one I'm working on and hopefully by that time I'll have been given the green light to be able to put full weight on my operated hip/leg so I can once again climb the stairs to my sewing studio and start to cut and assemble the patchwork blocks. It's been about seven weeks since I've been up there and I can just imagine the parties that the dust bunnies have been enjoying! I think we've had as much snow in the last two weeks as we've had in the four years that we've lived in Nova Scotia! I'm scheduled to see the orthopaedic surgeon this coming Tuesday which will mark six weeks since my surgery. Hopefully the roads will be cleared enough by then as we are expecting two more snowstorms, one this Friday and the other on Sunday or Monday. His offices and the hospital are seventy long miles away. I feel like I am getting stronger with each passing day and am sooooo looking forward to being self sufficient once again. Thank you all for your thoughts, prayers and good wishes as I continue down the road to recovery.